An article published in USA Today pointed out that nearly half of the serious hazardous materials spills in transportation go unreported to the government, leaving investigators without data to identify unsafe carriers and containers. The U.S. DOT has levied fines of up to $2,750 against carriers for failure to report serious hazmat spills, notes the article. Fines and penalties from state and local environmental regulatory agencies can go much higher. The DOT requires motor carriers which have transported a leaking package of hazardous materials or experienced a loading or unloading hazmat-related leak or spill to report incidents in accordance with the regulations in 49 CFR 171.15 and 171.16. Immediate telephonic notification is required is some cases, along with a written report. Most hazardous materials are dangerous when they are released, emphasizes the DOT, noting that the scene of an incident can be chaotic, and the right actions may not always be obvious. Tom Moses, an environmental attorney and president of Spill Center, a North American environmental claims and spill management leader, advises full compliance with environmental regulations. “Not reporting spills is unwise and not worth the risk,” he observes. “Carriers should instruct their drivers to report even spills that they think might not require a report. Drivers can never get into trouble for reporting something they did not need to report,” says Moses. He adds that drivers need to make sure that they get the name and phone number of the person who tells them they don't need to make a report. “That's the best defense in the world, not only for a failure-to-report violation at any level, but also for third party claims," he continues. Moses also advises drivers to log all actions they take after a spill. "That written record can be used to put the driver and company in a legally defensible position," he comments. "And don't forget to make any follow-up reports that may be required," he adds. "You can minimize the possibility of fines with timely, complete and accurate reporting." Insurance companies do not pay fines and penalties arising from failure to report fines or for late reporting. That often comes as a surprise to carriers and other types of companies at risk from accidental spills of hazmat, diesel fuel and other regulated materials. But that’s the very reason insurance companies do not train people to understand reporting documentation or controlling costs and limiting liability related to spills. Reportable quantities of spilled materials vary from jurisdiction to jurisdiction, and spills often involve multiple jurisdictions, confusing the issue. Failure to file required reports can bring stiff fines and penalties, making it unwise to try to cover up a spill or delay reporting because many jurisdictions have extremely small windows of time in which reports must be made. In Massachusetts, the DEP must be notified within two hours of the incident to avoid a late reporting citation. The reportable quantity of any petroleum product is 10 gallons. One truckload carrier, a long-time Spill Center client, received a late-notification citation after one of its trucks leaked 20-30 gallons of diesel fuel on the roadway after a saddle tank was punctured by a piece of metal in the road. A police officer followed the trail of oil until he came upon the truck, whose driver was unaware of the leak, and pulled him over. The driver informed the carrier’s maintenance facility and Operations to say he would be late on his delivery. But nobody notified the fleet safety manager, who would have called Spill Center immediately to make the required reports. Because of the breakdown in communications, the safety manager didn’t find out about the spill until the next day, missing the two-hour reporting window. He did call Spill Center, and the reports were made. The damage was done, however. The Mass DEP late-notification infraction carries a penalty of $11,500. Moses accompanied the fleet safety manager to the DEP enforcement hearing and was able to have the penalty reduced through a Supplemental Environmental Project agreement. The settlement required the carrier to install on its trucks an on-board electronic spill reporting system developed by Spill Center. The system features a spill macro, which is loaded into each vehicle’s onboard telematics. After a spill, the driver keys information into the macro and transmits it both to the carrier’s headquarters and to Spill Center to make required reports. Any fleet can become a spill generator, says Moses. The time to prepare for an environmental release is before it happens. Being prepared for environmental incidents – on the highway or at your facility – is the best way to contain costs and limit liability associated with spills. Fuel spills and other accidental releases of hazardous or regulated materials, even in small quantities, can turn into expensive incidents for the spill generator who is not adequately prepared to deal with them. By aligning yourself with experts who are equipped to provide assistance when you need it most, you broaden your state of preparedness and help minimize your fleet's spill-related costs and liability. Spill Center, for example, assists clients with custom spill contingency planning, makes cleanup contractor referrals, and handles all required regulatory reporting, incident screening, invoice auditing, and documentation of incidents. No fleet should ever have enough spills to get good at handling them. Moses founded Spill Center® nearly 20 years ago to “help level the playing field for spill generators who must deal with regulatory authorities, cleanup contractors and third-party claimants.” The 24/7 nationwide service is designed to reduce costs associated with environmental releases and mitigate potential liability. 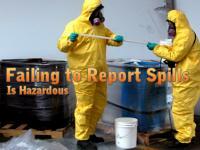 For more information on Spill Center subscriber services and how Spill Center can help your company become better prepared to handle spills requiring emergency cleanup, visit www.spillcenter.com or call Tom Moses at 978-568-1922, X22. You can email him at tmoses@spillcenter.com.